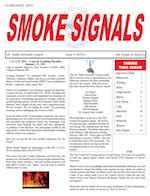 Smoke Signals is a monthly newsletter published by the Mount Diablo Silverado Council. The September issue is now available for download. Learn about the possible merge of MDSC with San Francisco Bay Area Council, Scouting for Food, upcoming resident camps and the annual L.E.A.D. event. Learn about leader training opportunities, key popcorn dates, upcoming resident camps and the annual L.E.A.D. event. 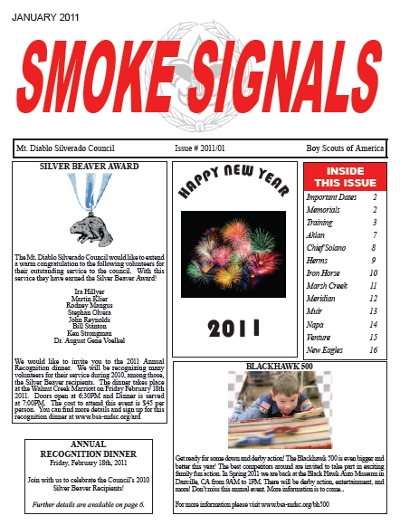 Smoke Signals is a monthly newsletter published by Mount Diablo Silverado Council. The August issue is now available for download. Learn about the Tour Plan that replaced the previous Tour Permit, a possible council merge, new members in Meridian district, Japan Relief Fund, and more. 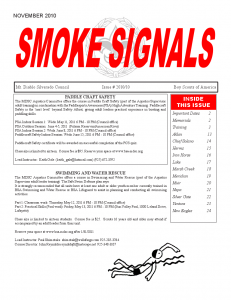 Smoke Signals is a monthly newsletter published by Mount Diablo Silverado Council. The May issue is now available for download. Find out the latest on Blackhawk 500, Family Flight Day, and training opportunities. 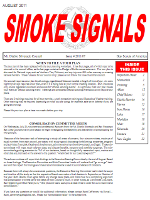 Smoke Signals is a monthly newsletter published by Mount Diablo Silverado Council. The April issue is now available for download. Find out the latest on Blackhawk 500, Cub family camps, Scoutreach golf tournament, and many more. 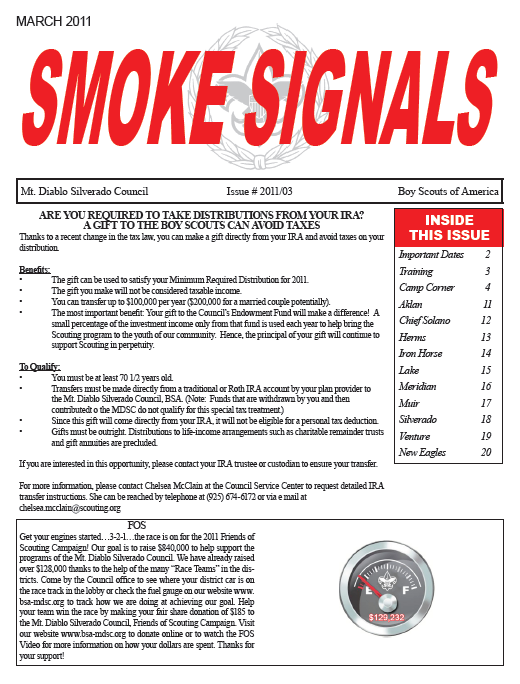 Smoke Signals is a monthly newsletter published by Mount Diablo Silverado Council. The March issue is now available for download. Find out the latest on Blackhawk 500, Cub family camps, Cub Scout rangemaster training, Scoutreach golf tournament, distinguished citizen luncheon, and many more. 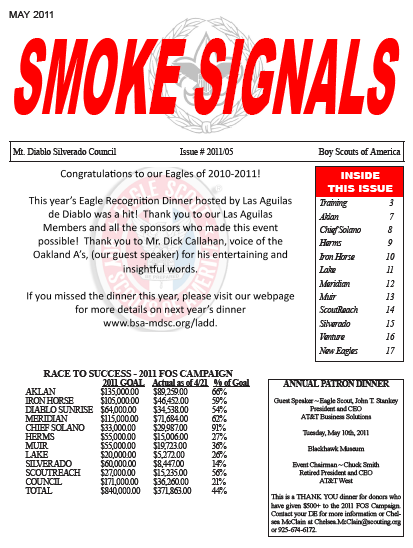 Smoke Signals is a monthly newsletter published by Mount Diablo Silverado Council. The February issue is now available for download. Find out what happened at L.E.A.D. and read on for news on Friends of Scouting, Equipment Swap, National Scout week, Cub Scout Day Camp, and many more. 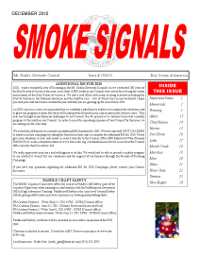 Smoke Signals is a monthly newsletter published by Mount Diablo Silverado Council. The first issue of 2011 is now available for download. Find out what is going on with the Council and read on for news on BSA's new unit recognition program, Blackhawk 500, National Scout week, Cub Scout Day Camp, and many more. 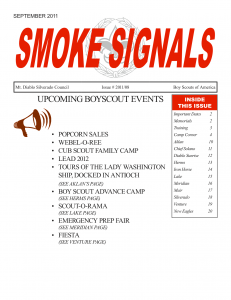 Smoke Signals is a monthly newsletter published by Mount Diablo Silverado Council. The last issue of 2010 is now available for download. Find out what is going on with the Council and read on for news on Popcorn results, upcoming LEAD, equipment/uniform swap event, training opportunities, and early bird savings for Advance Camp in 2011. 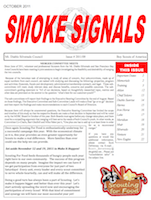 Smoke Signals is a monthly newsletter published by Mount Diablo Silverado Council. The November issue is now available for download. Find out what is going on with the Council and read on for news on Scouting for food, and upcoming training opportunities.